A glimpse of the things that get me buzzing. Innovation is on my mind this week as my Twitter feed, Facebook updates and general news watching is filled with updates from the annual Consumer Electronics show in Las Vegas. I’ve worked on enough products to know that coming up with the next great idea can often be an exercise in frustration. The list of new ideas are quickly dismissed as too hard to implement, not valuable enough or not exciting. I would have loved to have been in the meeting where Skip Hop’s “Complete Sheet” was brought up as an idea. Beyond the thread count revolution, there has been very few innovations in sheets. They have become larger to adapt bigger mattresses, utlilized different materials and sold in value sets. Nothing that would be described as revolutionary. Skip Hop has just turned the baby bedding industry upside down and, yes, their idea is patent pending. If you haven’t been looking at crib sheets lately, here’s the genius in the Skip Hop Complete Sheet–the decorative side panels. I bet at this point–you’re saying “that’s it?” Therein lies the genius, it’s so simple that it was overlooked. Today experts frown up any decorative materials in the crib due to the risk of SIDS. What every new mom wants is the House Beautiful nursery. Yet, they aren’t able to decorate the crib with the traditional bumpers. 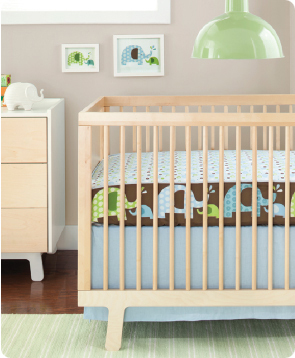 The new Complete Sheet now brings some of that decorating flare back to the central part of the nursery–the crib. Back to the meeting where this idea was discussed. Someone probably said that it would be too hard to do with the different types of mattresses, or the material needs to be just right so the panels fit nicely around the edges and doesn’t shrink. Thankfully any objections were overruled and now there’s these cool new sheets, which by the way, will cost almost twice as much as the standard crib sheet. The quest for innovation is not only about customer satisfaction, but it is also about finding an attribute to charge a premium for and bring more dollars to the bottom line. Right now it seems like the technology industry is struggling to understand what consumers really want. Prices have been declining on most accessories and the economic free fall seems to have no end in sight. However, I think the challenge to product development organizations is to bring customers true innovation and then the price premiums will return. One final thought is that a great product needs to be heard and seen. I’m not sure how long these sheets have been out, but I only discovered them because Skip Hop had an end cap at Target. The ideal marketing program will include good distribution and consumer demand generation–which is often not supported in small and mid-size organizations. What started out as my professional blog is now my new writing home. Primarily looking at life through a marketer's lens but still sharing fun, insights and mischief that gets you buzzing.